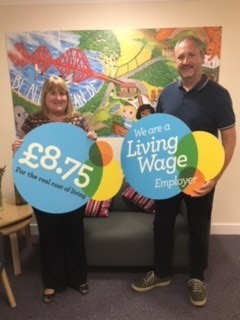 On 20th June 2018, we had a representative from the Living Wage Foundation visit our office in Glenrothes and spoke to our Chief Executive, Bob Bazley. "This month we visited Cairn Mhor Childcare Partnership in Fife. Formed 15 years ago by Dorothy Markham, the company offer residential care services for young people across x4 homes in Fife. Employing 53 staff, Cairn Mhor is headquartered in Airlie House Glenrothes. The motto of the organisation “Be all you can be” is proudly displayed on the walls. Bob Bazley CEO, has been involved with the running of company since 2016, who himself grew up in residential care as a child. Around 70% of Cairn Mhor’s workforce are care workers, with additional housekeepers, cooks and admin staff. When recruiting, the priority is the right attitude followed by qualifications. Bob reflected: “This work can be intense, and sometimes upsetting or stressful. Our recruitment process ensures people can be reflective in their day-to-day work, and that they can seek support and give support to their colleagues. We actively hire people who can demonstrate a solid approach to teamwork.” The teamwork is something he carried forward from his Army career. “Our goal is to become the premier service. We take a holistic approach to create a positive culture, and strive to treat people fairly in all aspects of our work. This means things like paying the Living Wage, but also paying people enough when they are off sick. It’s paying for things like physio therapy, or offering complementary counselling, and looking at our day-to-day procedures to ensure staff have the chance to offload concerns. We commit to valuing each person and supporting them to develop personally and professionally too… every little thing matters, each making an incremental difference to the whole package of fairness for our staff”. Bob himself is what we would describe as a Living Wage Champion. He led the accreditation journey for Cairn Mhor, as well as ensuring his own IT company (Netopa Ltd) was also accredited. As Chairperson on the board of a charitable trust "Muirhead Outreach Project" – Bob is supporting their accreditation journey too. He tells us: “I want to make a difference, and the Living Wage is a small part of that. It’s about challenging the norms and asking – why are we still doing things this way? It’s about small changes to create the type of society we want to live in”. On visiting the Glenrothes headquarters, we found on his white board a statement that read, “The best way to cope with change is to help create it”, and we couldn’t have said it better." We are delighted to announce that we have carried out a full GDPR audit and are fully compliant. Please take some time to read our Statement either using the tab at the top of the page or click on the link at bottom of the Home page. We are delighted to announce that the founder of Cairn Mhor Childcare Partnership Ltd and the Charity – Muirhead Outreach Project, has been recognised by the Queen for her services to Children, Young People and their Families in Fife. Dorothy Markham, who set up Cairn Mhor 15 years ago, has been awarded the British Empire Medal in the Queen’s Birthday honour’s list. This award is given to people who have made a significant difference in their local community with their hands on work and anyone who knows Dorothy knows that this is exactly what she has done. Starting up 15 years ago after a long career in Social Work she decided that she wanted to provide homes offering the best of care for young people who could no longer live with their families. The company has grown over the years and now has 3 houses and has looked after over 40 children during those years. Dorothy had the vision and courage to mortgage her house and risk her own savings to start the company. Not one to stand still, she also saw that there is a real need for help to be offered to families to prevent break ups and children being received into care so she set up Muirhead Outreach Project to meet this very need and it is still going strong providing support in many differing ways to 100’s of families across Fife. We are all so proud of Dorothy and glad that she has now received the recognition she truly deserves for not only having the vision but the drive and determination to make it happen and to ensure that so much support and help has gone to so many young people and their families. One of our young people was awarded Star of the Week at his dance schoolin March 2017 for breakdancing and at the beginning of June 2017 for Hip Hop. Well done! Staff and children recently visited Ryze in Edinburgh for a lot of jumping on trampolines and then some dinner. Staff were found to be bouncing around too and a lot of fun was had by all. Just as well dinner was after all that jumping up and down! We were very pleased, earlier this year, to receive a very positive report from the Care Inspector. We really value the review and the input as it helps us with our constant aim to develop and improve on what we do. We are all off to see “Cinderella” on the 28th December. All children and young people are welcome with staff and family. Pumpkins were carved and made a splendid display at each of the houses. After some local trick and treating the children and young people enjoyed a party and eating a few sweets!